After the 12th century, women were given a little more freedom to participate in Urban life, such as entertaining. However, because women were rarely able to be involved in work outside of the home without her husband or father, there were very few female entertainers. Entertainers during the Anglo-Saxon period were not looked upon favorably by society, especially women. They were considered to be a moral threat to society and could often face persecution. Dancing was especially looked upon unfavorably because of its pagan origins. It was believed that dancing distracted one from Christian worship. However, other forms of art were looked upon favorably, even in the church. Nuns, in their leisure time in between worship could embroider, write hymns, and compose music so long as their purpose was to praise God. It is through convents that we receive some of the best evidence of women’s involvement in music during this time. 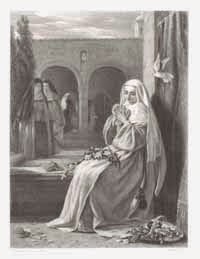 There was also involvement in visual arts, as nuns were also known to be painters and sculptors. Art outside of the church was not as common. Secular women who wished to participate in the arts often followed the convent traditions by working as illuminators. Although writing was not as common, women could also become writers. Certain courts allowed women to participate in creative writing. However, many women, even when able to read, were not able to write. Reading and writing were not taught together because they were considered separate. Therefore, in order to “write” they needed a scribe to assist them. Unfortunately, having a scribe wasn’t always the best solution. One of the great problems and worries women faced, because they often had male scribes, was that the scribes would claim their work as their own.